Bert Kaempfert | Easy Listening with great frequencies: a respectful update for Bert Kaempfert's orchestra sound. Easy Listening with great frequencies: a respectful update for Bert Kaempfert’s orchestra sound. 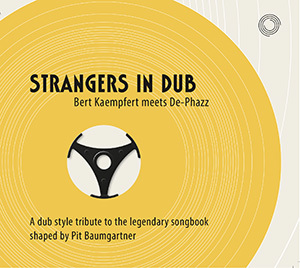 An extraordinary tribute album has been produced on the occasion of Bert Kaempfert’s 95th birthday: “Strangers In Dub” brings the easy listening maestro’s music into the present. 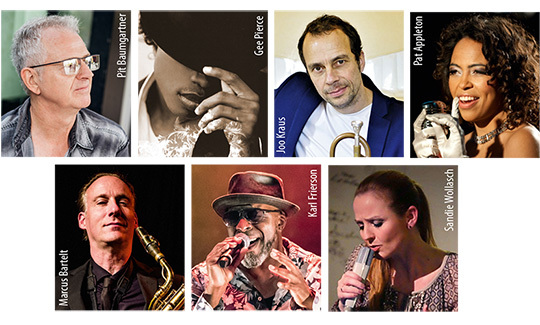 The album is the work of Heidelberg producer Pit Baumgartner with his band De-Phazz, which has been a pioneer in the field of well-tempered downbeat sounds since the 90s. The album is based on the album “SOOTHING THE TIGER. THE GENTLE SOUND OF HERBERT REHBEIN & HIS ORCHESTRA.” From this repertoire Baumgartner has chosen songs in which he found hooks and cool themes to compress, for example “STRANGERS IN THE NIGHT”, “MOON MAID”, “LADY”, “MALAYSIAN MELODY”, “LOVE AFTER MIDNIGHT” and “MY WAY OF LIFE”. The fiery De-Phazz singer Pat Appleton with her soul-inspired voice and Sandie Wollasch, who contributes the smooth elements, provide the nuances. Rapper Gee Pierce, who comes from the Wu-Tang Clan scene, adds the required bite on “SPANISH EYES”. In “MALAYSIAN MELODY” on the one hand he transports us back to the atmosphere of the 60s, turning the song “into a number that could well have been heard playing on a jukebox in an ice-cream parlour.” On the other hand Sandy Wollasch brings us back to this century with her euphoric singing style. Different versions of the global hit “STRANGERS IN THE NIGHT” have been sung countless times, by the American crooner Frank Sinatra and Germany’s iconic Udo Lindenberg, among many others. As this song is so famous the world over and is recognised after about two seconds, Baumgartner started with the middle section, which seems to drift over to us from another planet. “With this song I always used to have images from the 60s in my head, black-and-white TV, Hans-Joachim Kulenkampff, Peter Frankenfeld.” Pit Baumgartner blasts these associations away with a pastiche of voices that sound as if they come from another planet. In this way its unique melody suddenly appears in a completely different context, allowing the listener to appreciate its beauty with new ears.